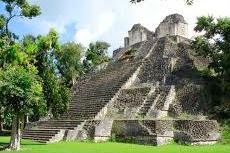 Kohunlich and Dzibanche Mayan ruins is an excursion from Costa Maya. Still developing this site one can access all ruins and walk inside all but 1. Our excursion was a combo of Dzibanche and Kohunlich. Both the Kohunlich and Dzibanche ruins were well-preserved and our guide Cruz was friendly and informative. Must bring insect repellent as the ruins are in the jungle. Each way was 2.5 hour long but there was a toilet on the coach. Good service, easy to find the meeting place, would use them again. The Chaccoben excursion was cancelled and Kohunluch and Dzibanche were substituted. We actually took a double Mayan Ruin tour to Dzibanche and Kohunlich Mayan Ruins. Incredibly informative tour with Hugo and driver Emerlin. We actually visited Dzibanche and Kohunlich ruins. We actually visited Dzibanche and Kohunlich ruins. Was a gorgeous day - we were the ONLY group at either ruin. Guide was very knowledgable. Enjoyed climbing the ruins. We did the Dzibanche and another ruin site 1/2 hour from the first. We took the Kohunlich & Dzibanche tour with Thomson. We took the Kohunlich & Dzibanche tour with Thomson. A long drive to the ruins. Lunch included. Interesting day out. It was very hot when we visited take plenty of water, also suncream. Dzibanche ruins are a drive out, but worth the trip.